Now, the people who would have benefited most from the new feature — the blind, and others with reading disabilities — have made it clear that they're not going to stand for it. It is not that easy for 300 plus people (even with super smart dogs) and kids in tow to walk in a long circle for two hours holding big signs... These people were tough. It was an honor to walk with them. 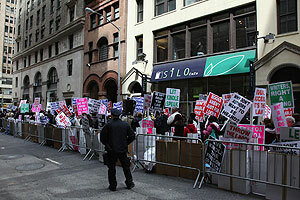 In a statement, The Authors Guild called the protest "unfortunate and unnecessary," and declared, "We will not surrender our members' economic rights to Amazon or anyone else." They offered a novel solution to the problem: Amazon could maintain a registry of verified blind and disabled people, who would be granted special permission to use the text-to-speech feature. The suggestion is of course ridiculous. Contrary to The Authors Guild's claims, the text-to-speech feature does not violate copyright law and does not pose any competitive threat to writers. The feature should be enabled for all Kindle customers, not just those with disabilities. The Authors Guild rightly laments "how difficult the road ahead is for the already fragile economics of authorship" — but this is exactly why it was nonsensical of them to force Amazon to adopt a system that has made it more difficult for blind and disabled customers to legally purchase and read authors' works. My daughter is visually impaired and she should be able to have access to the same literature everyone else does. I would think most authors would like to attract a wider audience. Braille books aren't always available, so why should my daughter and everyone else in the world who is blind or visually impaired be restricted access. Back in the day, books on tape saved me when I was unable to physically read and/or hold a hard-copy publication. In this time of highly refined technology, the act of preventing access to information is unthinkable. Access to printed material is critical to blind and other print disabled people if we are to compete effectively with our sighted counterparts, and as someone who reads "talking books" regularly, I would love to have access to a broader variety of materials. Not only that, I feel that since I am willing to pay for books, I should be able to access them just as others do. 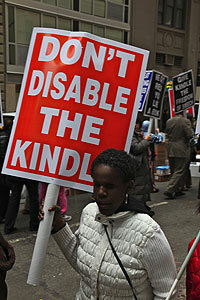 The protest over the Kindle is just one area where disability rights are intersecting the fight over IP law. Globally, groups like the World Blind Union, EFF and KEI are working to ensure that copyright's exceptions and limitations really do provide the access to knowledge that lawmakers intended, and are not impeded by inconsistencies or overreaching anti-circumvention provisions.